Our work is primarily based around research and education. The UK is home to an incredible variety of shark species, which many people simply don’t know about. While we want to learn more about these sharks, we also want to engage the public’s interest. 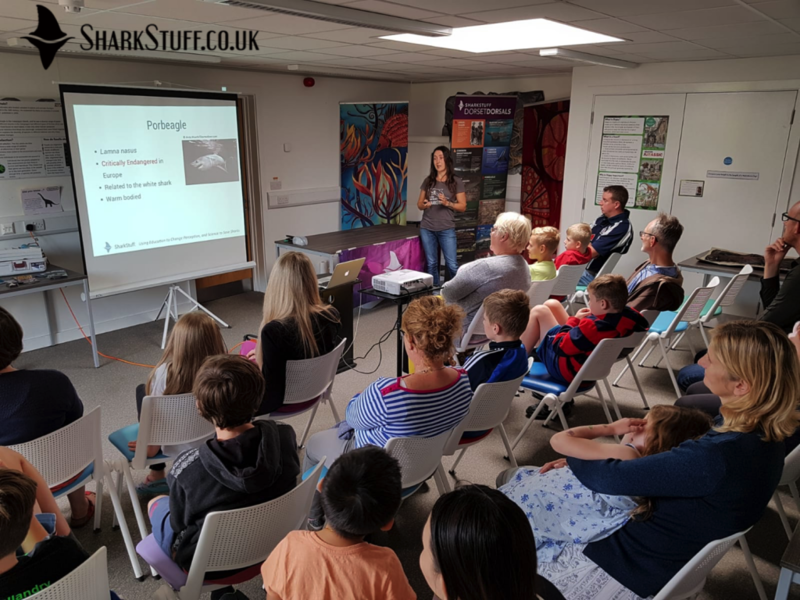 Outreach is a massive component of what we do, hosting events such as eggcase hunts and themed activities for kids. In short, the SharkStuff vision is one of ‘Shared seas, safe sharks’. We want to make a difference through education, so that people can enjoy sea based activities with an informed respect for its denizens. Georgia French (SharkStuff founder) giving a talk on Porbeagles. What’s my role at SharkStuff? I was invited to join SharkStuff as a Trustee, shortly before its formation as a charitable organisation. I’d met founder Georgia French in South Africa back in 2015 and contributed towards her PhD. We kept in touch, had always aimed to collaborate again and SharkStuff offered the perfect opportunity to do so. I’m therefore involved with all our key decision making and strategisation. I also developed our logo, website and handle the creation of many of our marketing materials, when required.